I'm grateful to LABOR: STUDIES IN WORKING-CLASS HISTORY OF THE AMERICAS for organizing a Bookmark forum on Collision Course. 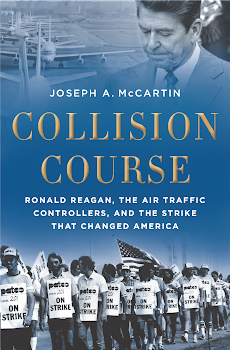 In that forum, I was honored to have my book discussed by four smart and knowledgeable people: Jack Metzgar, whose own book on the 1959 steel strike is one of the best ruminations ever written about a strike; Liesl Orenic, a fellow laborer in the vineyards of aviation labor history, from whose work I have learned so much; Rosemary Feurer, whose book Radical Unionism in the Midwest, 1900-1950 demonstrated a keen understanding of internal labor dynamics of the sort that I wrote about; and Dave Sapadin, a former air traffic controller who lived through some of the events in the book. LABOR Online, the blog of the Labor and Working Class History Association has posted the contributions to this forum this week along with an introduction by Rosemary. You can find it here.